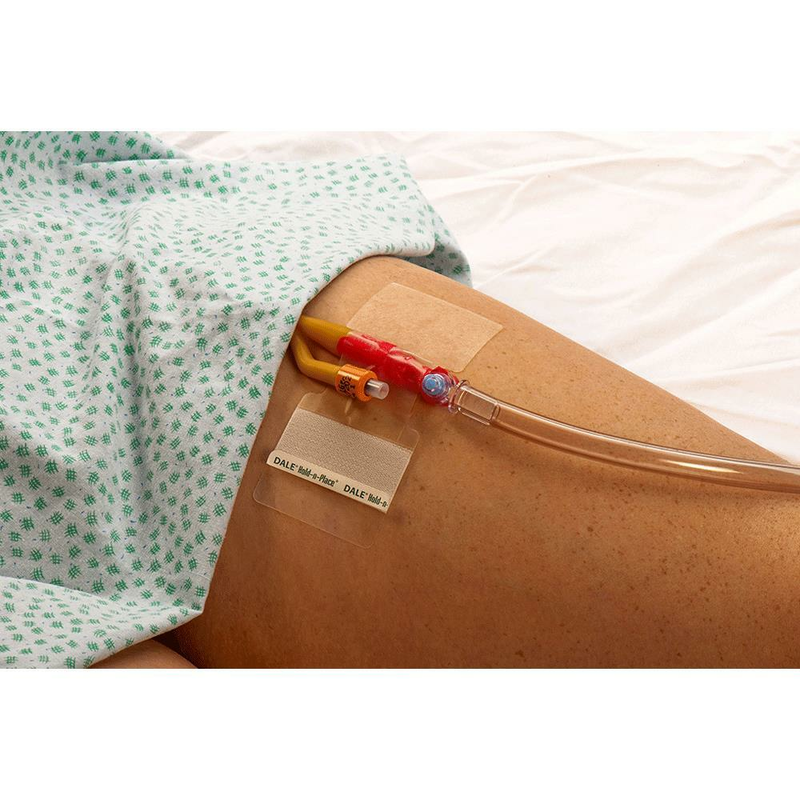 Dale Hold-n-Place Foley Catheter Holder stabilizes the indwelling catheter, reducing the likelihood of traumatic removal, without restricting patient movement or irritating the skin. It helps the user put an end to the problems associated with tape and reduce the potential for infection. This Foley catheter tube holder features a patented locking system that securely anchors the catheter in place, reducing the risk of urethral erosion, bladder spasms and trauma. How to use Hold-n-Place Catheter Holder? A. Clean and prepare application area. B. Open Dale Hold-n-Place adhesive patch to expose center liners. Remove center liners and place urinary catheter onto exposed adhesive. C. Wrap the locking tab beyond the lumen of the catheter, where the drainage bag connects. You may remove the top liner for extra securement. Remove baseliners to expose adhesive and apply to skin. D. Dale Hold-n-Place catheter holder should appear as shown when securement is complete. 1. Position the leg band high around the thigh with Dale product label pointing to the inside of the leg. Stretch leg band in place and fasten velcro tab. Proper compression has been achieved when two fingers fit snugly under the band. 2. Place foley catheter over white stitching of green tab. Leave an ample loop in catheter above leg band to avoid bladder traction; or stretch catheter for traction when required. 3. 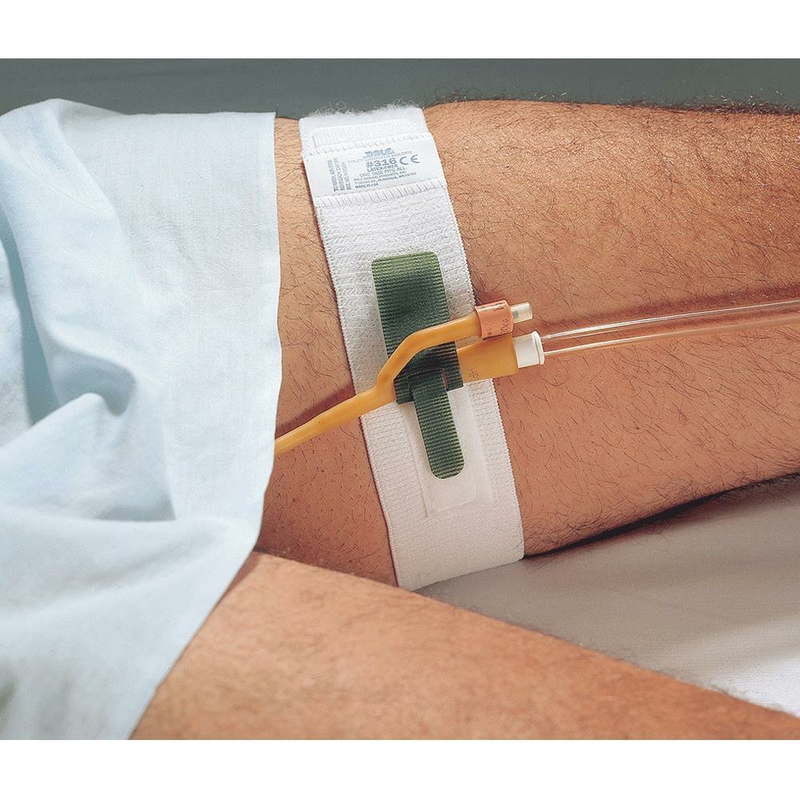 With the catheter in the desired position, insert the narrow, green tab over the catheter and through the square opening so that green tabs overlap. 4. Lock catheter in position by pulling green tabs in opposite directions. Secure tabs in place. To reposition catheter: raise either green tab, adjust catheter and refasten tab. To secure the catheter in place position the waistband around the abdomen, above the wound site. No shaving necessary. The green catheter-locking tab should be centered over the drain site. After the band has been positioned, press locking tab onto the waistband. Place catheter over white stitching of green tab. 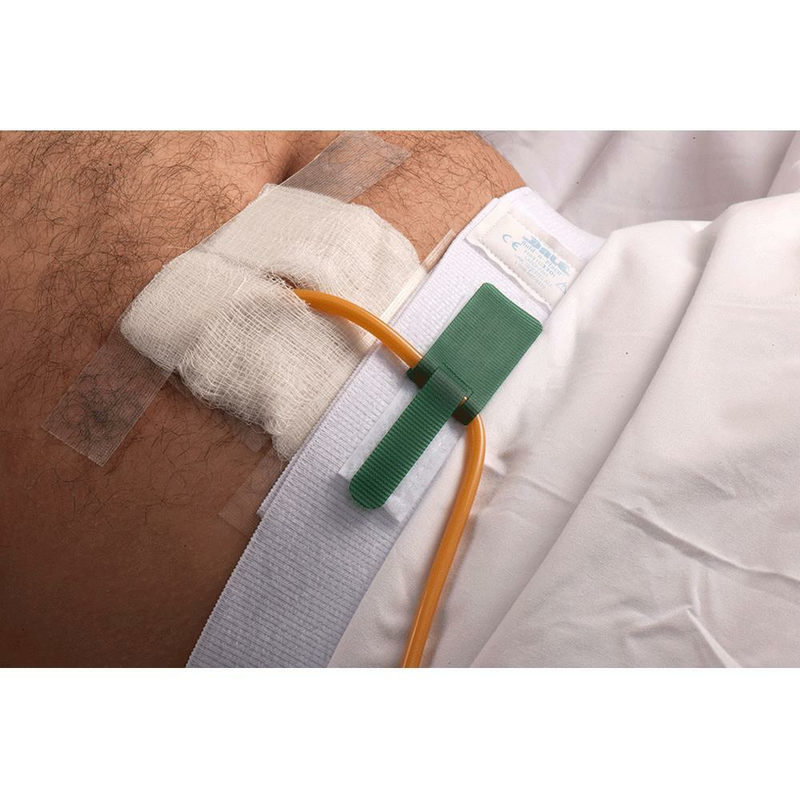 With the catheter in the desired position, insert the narrow, green tab over the catheter and through the square opening so that green tabs overlap. Lock catheter in position by pulling green tabs in opposite directions. Secure tabs in place. To reposition catheter: raise either green tab, adjust catheter and refasten tab. Another method of securement is to locate the Y port of the proximal end of the catheter into the locking device. How can I reposition the tube while using adhesive patch? The locking tab may be lifted to reposition the tube while using Dale Hold-n-Place Adhesive Patch. How long will the patch last ? As per manufacturer, 3 days. I hope this helps. What are the Patch Dimensions? 4 1/2" x 1 3/4" at widest point.